Competition test riding can bring up a lot of emotions. Being judged and tested can trigger all kinds of anxiety, but it doesn’t have to be like that. The reality is that we need ways to measure our results. Many problems riders have at home are a result of unclear goals, lack of a plan, and not having a way to measure their progress. Although my entire Dressage Naturally program is designed to help students be able to self assess and make progress independently (and it works really well), the truth is that I did a lot of competing in my past and it played a big role in making me the rider I am today. There IS a way to practice and perform dressage tests and have it be a positive experience for horse and rider! Competitions can be a place to bond and connect with your horse and improve your focus and emotional fitness, if you set yourself up for success. Perfecting tests and going to shows is an entirely different skill set and many riders overlook that. If you prepare well, it can be an excellent learning tool and confidence-builder. If you don’t prepare well, at the end of the show day you could be left at least $500 poorer and have less confidence than before. I have seen this happen many times with students. No wonder many people don’t want to compete! Most problems riders have at dressage shows are a result of unclear goals, unrealistic expectations, poor preparation, or not understanding how to interpret their results. All of those can be managed and improved upon, especially if you avoid the 5 stressful mistakes. When I started competing, I traveled with my trainer and all her students. I learned by immersion, osmosis, trial, and lots of errors! Most riders don’t have the opportunity to travel with their trainer and are left to just wing it. 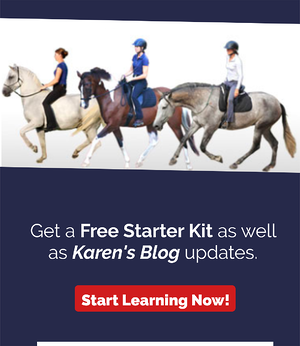 There are not many resources out there to tell you HOW to prepare for, practice for, and use dressage competition tests to further your progress. (That’s why I created my own resource for this!). Many instructors focus only on the riding part, and leave their students to figure everything else out on their own. Notice that ‘riding well enough’ wasn’t on the list of the 5 most stressful mistakes! If you decide to do a show, make sure you take it upon yourself to plan it well! What if you don't want to compete? Those who know me may be thinking: But Karen, I don’t see YOU competing these days! That’s right, competing is not high on my priority list at this point in my life, but the fact remains that I would not be where I am today if I hadn’t gone to a LOT of shows in the past. For about 20 years, I or my students competed almost every weekend for 6 months of the year. It was not unusual for me to be riding 4 different horses in 2 tests a day, and to have 6 students showing their own horses in the same show. We did well. I have national awards, and my students and I have won champion or reserve champion in every level from Training to Grand Prix at regional finals. I’ve ridden in CDI shows, and I represented the U.S.A. at the North American Young Riders Championships 4 years in a row. As I train today, I still use the competition tests as part of my training exercises. They are a great way to measure myself and guide my goals. With each of my horses, I know what tests I could do right now and which I am still working towards. I can do this because of all my experience riding tests. I want my students to gain the same kind of confidence, emotional fitness, and goal setting skills I learned by practicing tests. Now, I know some people are ‘anti-competition’ on principle. They may say that ‘real classical training’ is about riding today so tomorrow is better, where competing is about making right now look like it is working, even if it’s not… There IS another choice. You can train every day so that tomorrow is better AND put a date on the calendar to perform what you can do. It’s a matter of choosing the test that your horse will find easy. Competition and test-riding can bring out the worst in people. We’ve all seen it, and we heart-centered equestrians don’t like to be around that. With the right preparation and mindset, you don’t have to become that. It is a choice to allow yourself to be critiqued without becoming crazy from fear of failure. It’s a choice to still make excellent decisions for your horse even under pressure. One of the beautiful things about dressage is that you can truly compete against yourself. You can strive to improve your scores over time, regardless of who else was in your class and how they did. If you really don’t want to compete, you can still learn how to practice the tests and find other ways to give yourself goals and deadlines. Some of my fondest experiences of being a partner and a team with my horse have been at competitions. It is satisfying to spend that kind of focused time with your horse, being his reference of safety in a strange place. There’s nothing quite like the feeling of preparing and then performing successfully, when success means that you were a good partner for your horse, your horse felt confident in what he was doing, and you both did your best. Riding tests and competing takes practice and the right kind of preparation, but in the end you may be surprised at just how much progress you can make, and how much fun it can be. If you liked this article and want to learn more from Karen, Click HERE to get an excerpt from Karen's book, 3 free training videos, and a Happy Athlete Assessment!